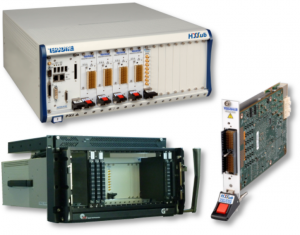 Teradyne test instruments are renowned for their longevity and versatility; powerful Spectrum 9100 system as well as solutions for LMSTAR, eCASS, and NGATS serve as the backbone of major aerospace and defense test platforms. 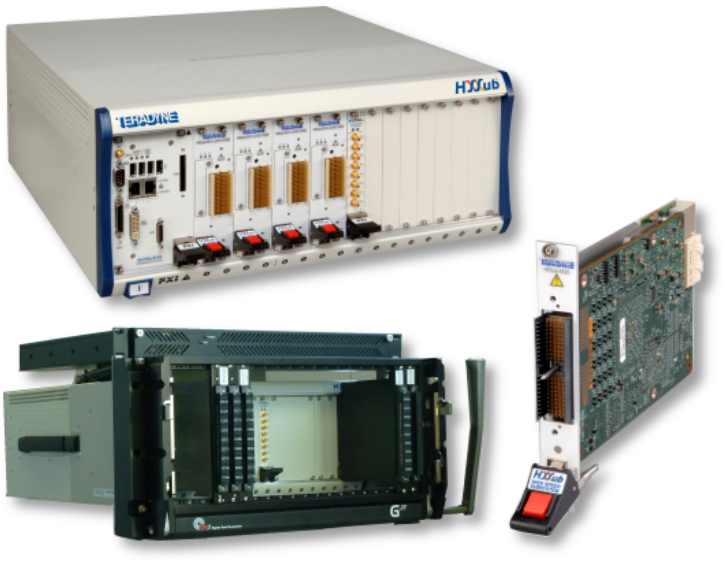 When populated with flexible, high-performance Di-Series and High-Speed Subsystem (HSSub) test instruments, these systems fulfill the roles of many digital test instruments. Teradyne instruments have now been extended further—through the use of the Teradyne Boundary Scan Runtime Library (TERBSR), these instruments can be deployed as JTAG controllers for boundary-scan testing with no additional hardware required. Combining ScanExpress boundary-scan software tools from Corelis with the same Teradyne hardware that powers high-end ATE systems means JTAG structural and functional test capabilities have become more accessible and convenient than ever. Complete support for Teradyne HSSub and Di-Series instruments with Corelis ScanExpress software tools. The Teradyne HSSub or Di-Series instrument acts as a single-TAP JTAG controller with configurable pinout. Adjustable TCK rate; up to 50 MHz on supported models. Configurable voltage level, threshold definitions, and slew rate. ScanExpress software support for Microsoft Windows 7, Windows 8/8.1 and Windows 10. Easy integration with instruments installed in standard Teradyne test systems running a Microsoft Windows OS. *ScanExpress JET test execution not currently supported. The ScanExpress family of boundary-scan tools offers a fully integrated development environment that includes automatic boundary-scan and at-speed functional test program generation, test program execution with advanced pin-level diagnostics, interactive boundary-scan debugging, and In-System Programming (ISP) of devices such as Flash memories, Serial EEPROMs, CPLDs, and FPGAs. The ScanExpress applications are modularized allowing the creation of custom-tailored solutions for any user. From full development stations and production-only test stations to field service programming stations, flexible feature sets are available to suit any company’s individual requirements. ScanExpress applications offer a graphical user interface (GUI) for test execution using a Teradyne instrument as a JTAG controller. Controller pin assignments, advanced voltage settings, and slew rate can be fully configured. Corelis execution applications also include application programming interfaces (APIs) for execution control through the test station’s system software, with support for Visual Studio, Keysight VEE, National LabVIEW or LabWindows, and more. Adding Corelis JTAG/boundary-scan tests to a Teradyne ATE system is as simple as installing an application. A variety of license types are available to meet the requirements of any organization. Corelis’ boundary-scan software is compatible with Microsoft Windows 7, Windows 8, and Windows 10 operating systems, making installation on Teradyne Spectrum-9100 and similar Windows-based systems a breeze. Add boundary-scan test capability to your Teradyne test platform with no additional hardware. Add Corelis boundary-scan tests to VXI and PXI Express test systems by utilizing Teradyne’s powerful digital I/O instruments. Get a higher return on your investment by integrating JTAG structural and functional tests with an existing ATE system. Add JTAG/boundary-scan functionality to an already modular hardware platform. ScanExpress tools support Teradyne Di-Series and HSSub instruments through the Teradyne TERBSR interface. Corelis also offers hardware JTAG controllers designed for maximum performance with interfaces including USB, LAN, PXI, PCI/PCIe, and more.